Account for the requirements of your mission critical production environment. Avoid the complexity and risk of building out as you go. Avoid deploying without a fully defined architecture. Achieve an environment that is highly available, scalable, and secure. 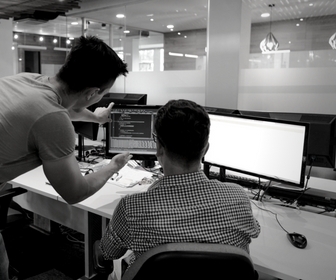 Flexible to suit the needs of your infrastructure — we will help you plan your EDB Postgres™️ architecture from the start, or review your existing architecture and and assist to implement according to best practice — from Initiation through Post Workshop. We’ll accomplish these 3 important steps at project initiation. We will conduct a comprehensive 5-day workshop that includes deliverables based on the EDB Postgres️ reference architecture and our well-defined best practices. At the conclusion of our engagement, the EnterpriseDB team will conduct a web conference to review your Services Engagement Completion Report. The report will outline what we have configured and the specific parameters used. We will review this information in deep detail, and conduct a comprehensive knowledge transfer. Our goal is to set you up for success with the knowledge and tools to manage your EDB Postgres™️ environment going forward. 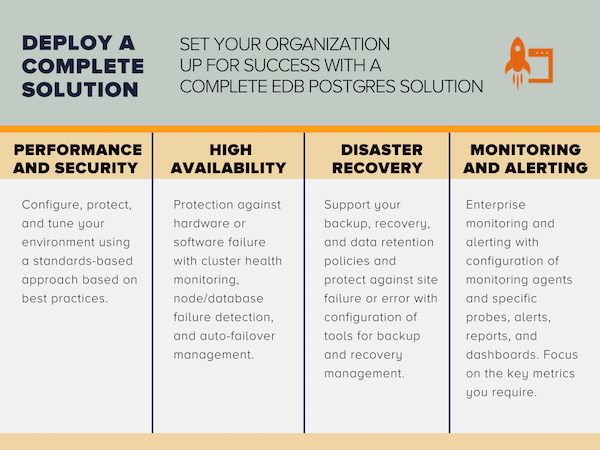 EnterpriseDB®️ is committed to helping you achieve success developing and deploying Postgres solutions. We only need the following items completed in order to get started. TECHNICAL PREREQUISITES: Prior to the engagement, our team will supply you a list of technical pre-requisites that are required to be in place before our consultant arrives on site to begin the service.